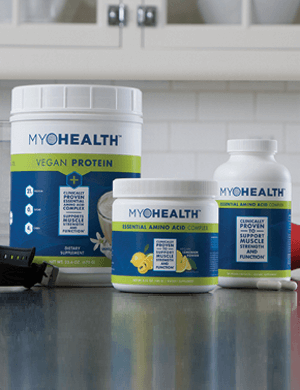 Begin by buying one bottle of MyoHealth. When you do, we’ll send you a second bottle—FREE! Double your dosage (that’s two servings a day) for the first 30 days to build up your body and prove the power of MyoHealth. Live it, love it and share your lifestyle improvement story of hiking higher, hitting it further and dancing longer. 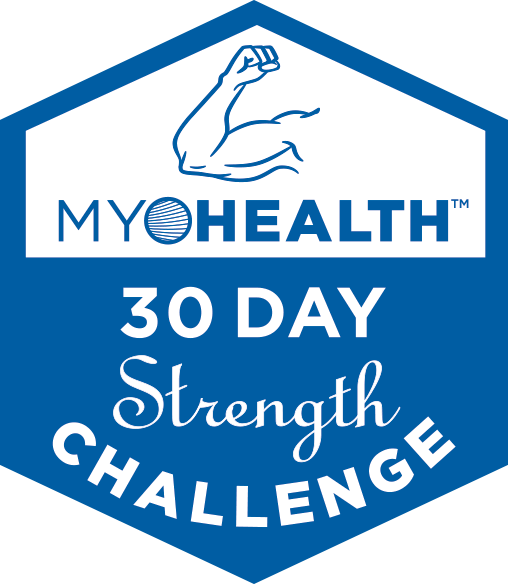 After you complete the challenge, send us your story and get a FREE MyoHealth t-shirt. Offer Includes: A free copy of Robert Wolfe, PhD’s book The Building Blocks of Life, and a handy shaker bottle. Just pay $49.99 + $7.99 S&P = $57.98. Are you getting older and not seeing the gains of leaner, stronger muscle as quickly as you used to when you exercise? It’s not your imagination, and it’s not just YOU. We lose muscle mass and strength as we get older. Building lean muscle mass becomes progressively harder and losing muscle becomes far easier as we age. As the years go by, you spend more time sitting at work and home and less time moving throughout the day. Between a sedentary lifestyle and nature taking its course, your muscle loses the youthful metabolic zip they once had AND your energy levels plummet to record lows. The loss of muscle can start in some people as early as age 30, but by age 50, almost everyone is starting to lose a significant amount of muscle. Is there anything that can help? Yes! 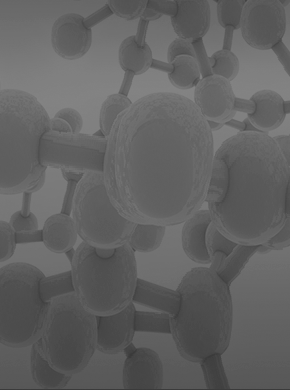 Essential amino acids. BUT your body can’t produce EAAs on its own. Essential amino acids (EAAs) are the only macro-nutrients that are absolutely required in our diet. They not only keep us alive, they improve our metabolic function and physical capacity. Hence, you can be the proverbial couch potato OR you may be physically active outdoors or at the gym and consuming ample protein in your diet either through food or supplements, but your protein synthesis is still less than optimal compared to younger days. Before you know it, your health, vitality and energy decline, pant sizes and exhaustion go up, and your doctor may be diagnosing you with prediabetes or diabetes. The right balance and ratio of essential amino acids are clinically proven to reverse and prevent muscle loss. 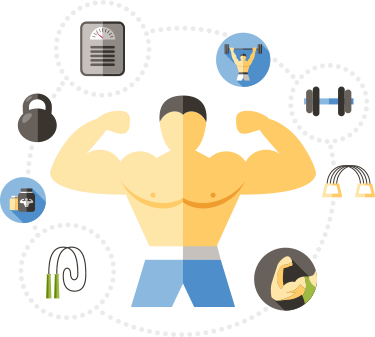 When combined with good dietary choices and physical activity, gains are even greater! 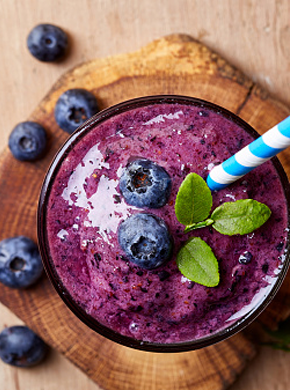 Studies* have shown… ingesting essential amino acids significantly improves muscle protein synthesis in multiple age groups including the elderly. 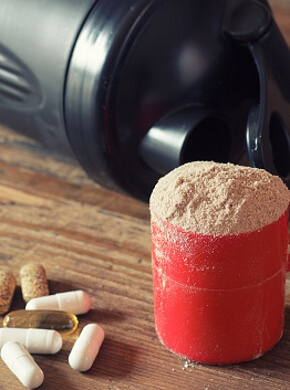 When exercise was added to the right balance and ratio of EAA supplementation, respondents experienced over twice the results of muscle protein synthesis! 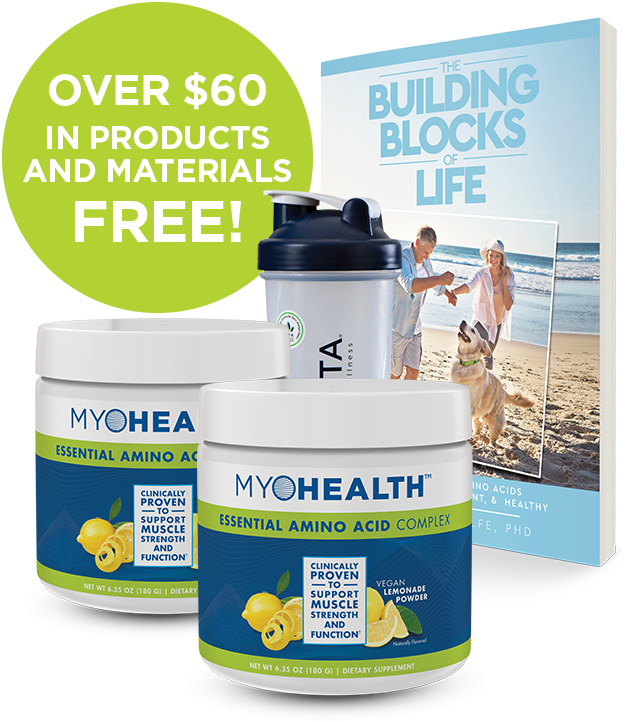 MyoHealthTM is the only line of products that contain a US-patented, 9 Essential Amino Acids complex blend clinically proven to support muscle strength and function. 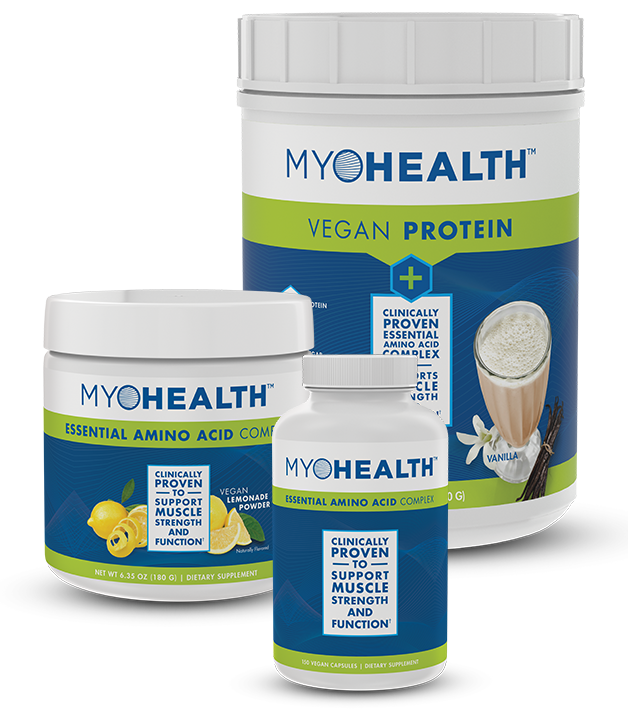 Developed over 20 years, $20 million in research funding and based on findings from NASA, National Institutes of Health (NIH), and 24 clinical trials, MyohealthTM is the first and only product line to feature a unique, highly effective formulation of a US-patented, Essential Amino Acid complex blend. Dare to Dream Big! Join our community and start making your dreams come true! No Thanks Sign Me Up! 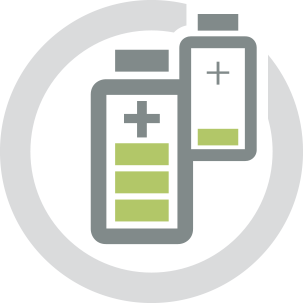 © 2019 Copyright MyoHealth. All rights reserved.